Rectangular sections with diamonds at the corners and center decorate this platinum retro-modern wedding band. 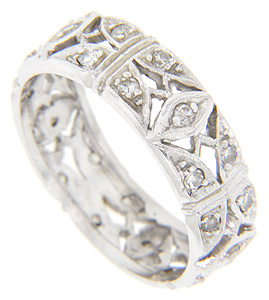 The vintage wedding ring features a cut-out look and measures 6.1mm in width. Circa: 1940. Size: 7 1/2. Cannot be re-sized.